New Decorated Origami Paper Crane Daily for 1,000 Days - Colossal. ICYMI: Stephen shares the ASC Bologna Extra in his Personal Pens video. 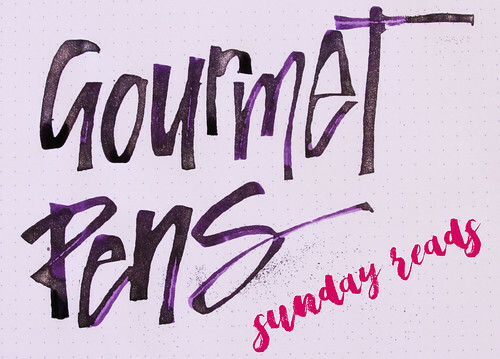 Guide to metallic and glitter ink pens and markers - JetPens blog. Amazing Things Happen at the Grand Canyon - Twisted Sifter. Holiday mulled latté - Love and Olive Oil. The essential calligraphy travel kit - The Postman's Knock. Towering Hyperrealistic Cactus Paintings by Lee Kwang-ho - Colossal. DIY watercolor gift tags - Tell Love and Party. More If Animals Were Round - Bored Panda. Inkdependence reviewed Franklin-Christoph Honeycomb and it looks delicious! Quirky New Felt Storybook Characters by ‘Cat Rabbit’ - Colossal. Spiced hot chocolate layer cake - Kitchen McCabe. DIY salt dough donut ornaments - A Beautiful Mess. Never too late for ornaments.